When you choose Goodyear tyres, you’re rolling with a long history of innovation and award winning quality. Drive with a tyre that’s made to feel good. Goodyear unveiled its latest concept tyre, Eagle-360, at the Geneva International Motor Show. The spherical, 3-D printed tyre highlights Goodyear’s vision for the future and presents an inspiring solution for the long-term future when autonomous driving is expected to be more mainstream. According to a recent study, 85 million autonomous-capable vehicles are expected to be sold annually around the world by 2035. 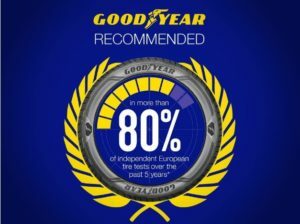 Goodyear recommended in 80% of magazine tests. Summer, Winter and All-Season tyres aren’t just highly rated, they’re also highly recommended. In over 80% of independent European tyre tests over the past 5 years, our winter summer and all-season tyres were recommended for everything from grip to braking. That’s because Goodyear’s engineers test each new tyre design against more than 50 performance criteria. To ensure each Goodyear tyre lead to better driving experiences. Check your tyre pressure and tread depth regularly. Goodyear recommends a minimum tread depth of 4mm for winter tyres to ensure optimal performance, but in colder countries where using winter tyres is mandatory, tread depth will be specified by law.